Great news for everyone today, our new Pledge Total with our extra funding campaign is now over $160K CAD. The Northern Kodiak stretch goal is now unlocked and we'll be adding 1 to all the Core Starter Sets. This brings the number of miniatures included in the War for Terra Nova - Core Starter Set up to 52. We have also added the Kodiak to the Pledge Manager Add-Ons Available section at $10 extra pledge each for Backers who want a second or third one for their Northern Strike or Fire Support squads or as a Support Unit. 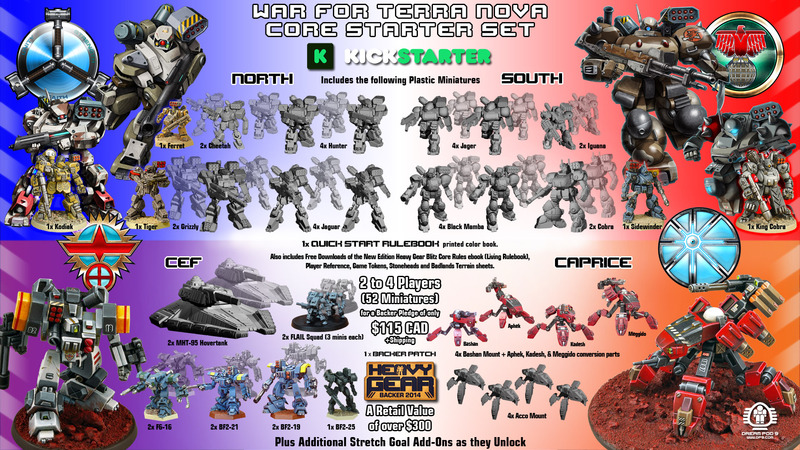 Below is an updated image of the Core Starter Set contents, click on it to see a larger image. Next stretch goal is the Caprice Ammon Mount at $170K CAD, to add 1 to the Core Starter Set. Help us spread the good news and let everyone know that our extra funding campaign has 3 weeks left to go, ending a the end of this month. Here is a direct link for new Backers to get on board and setup an account on the War for Terra Nova Pledge Manager.